Washington (CNN) - Before heading to Martha's Vineyard for a week-long family vacation, President Barack Obama took questions Friday from reporters at the White House. He hadn't held a formal, solo press conference since April 30 - and topics ranging from the economy to government surveillance to terror threats arose at Friday's question and answer session. 4:31 p.m. ET: Looking for a breakdown of the president's news conference? Look no further. From CNN Capitol Hill Reporter Lisa Desjardins: POTUS Newser By the Numbers. 4:02 p.m. ET: CNN Chief White House Correspondent Jessica Yellin notes that Obama didn't seem to get "prickly" during Friday's press conference, compared to previous sessions. The testiest moment came during his defense of Obamacare, during which he went after the GOP for trying to repeal his law without offering their own plan. 4:01 p.m. ET: And that wraps up the president's news conference - he took eight questions, and spoke for just under an hour. 3:58 p.m. ET: On immigration, Obama says he's well aware that no bill will completely solve the problem of undocumented immigrants in the U.S.
"There are very few human problems that are 100% solvable," he says. 3:56 p.m. ET: Next question, from NPR: How much leverage do you have in getting Congress to pass comprehensive immigration reform? 3:55 p.m. ET: Obama says he won't engage in negotiations with Republicans that include the threat of a government shutdown. Obama – "the idea that you would shut down the government unless you can keep 30 million people from getting health care is a bad idea." Asked about the last time he spoke with Boehner, Obama said he thought it was probably before Congress left for the August recess last week. 3:53 p.m. ET: CNN Chief White House Correspondent Jessica Yellin asks Obama about the GOP threat of a government shutdown unless Obamacare is defunded. 3:51 p.m. ET: "There are going to be glitches" in implementing Obamacare, the president concedes, but he adds that shouldn't detract from the law's benefits. And he adds that Republican threats to shut down the government unless Obamacare is defunded aren't in the interest of the American people. 3:49 p.m. ET: Going after Republicans for the first time in the news conference, Obama says the GOP's "holy grail" is making sure 30 million Americans are uninsured. He says their assertion is that "people will be better off without it." 3:48 p.m. ET: Obama is asked to explain why the employer mandate - which required businesses with 50 or more workers to provide employees health insurance - was delayed by a year. He said that aspect of Obamacare was not the "core" of the law, and that other elements were already being set into motion. Obama – the core of Obamacare implementation has already taken place. Good line on getting Benghazi killers: "I didn't get UBL in 11 months either." 3:47 p.m. ET: In response to a question about when the perpetrators of the Benghazi attack would be charged, Obama said it would take time. “I also said I’d get Bin Laden, but I didn’t get him in 11 months," he said. 3:46 p.m. ET: Obama is asked a two-part question by Fox News: one on the terror attack a year ago in Benghazi, Libya, and one about the president's health care law, which is in the process of being implemented. 3:43 p.m. ET: "We are not going to completely eliminate terrorism," Obama says in response to questions about current terror threats. But when pressed about operational tactics used to kill terrorists - namely, drone strikes - Obama refers back to a speech earlier this year. 3:41 p.m. ET: Obama says it's still accurate to say that al Qaeda's traditional core in Afghanistan and Pakistan has been reduced, but that threats from affiliate organizations, like al Qaeda in the Arabian Peninsula, still remain. Nice question, @jonkarl. Open-ended about the drones... and pivots al Qaeda to core al qaeda same way the admin. used them interchangeably. 3:41 p.m. ET: The fifth question, from ABC News, is about recent terror threats, and Obama's campaign assertions that "core al Qaeda" had been decimated. POTUS – KEY NSA ansr: I am comfortable that these programs are not being abused; I just need to make Americans more comfortable. 3:38 p.m. ET: Obama says he's "comfortable the current system is not being abused," and that if Americans fully understood the law, they would agree. Did we know before that there was an ongoing review of the intel programs? Was it public info before the leaks? 3:35 p.m. ET: Obama denies that he's changed positions on government surveillance, but that he's now supporting greater transparency in the programs. He suggests embedding some "technological fixes" that provide another layer of oversight into the surveillance systems. 3:33 p.m. ET: The fourth question, from the Wall Street Journal, goes back to the government surveillance programs. "Why should the public trust you" on the NSA programs, asked Carol Lee. 3:29 p.m. ET: Obama acknowledges the choice of the next Fed chair will be one of this "most important choices" of his second term. But he says that criticism surrounding Larry Summers, who was the director of the National Economic Council earlier in Obama's administration, is unfair, and that both potential candidates could successfully fill the role. "Both are highly qualified candidates," he said, adding he would make the decision in the fall. POTUS Answr 3: Fed chief is one of most important decisions, like SCOTUS. I have a range of good candidates, including Summers and Yellen. 3:27 p.m. ET: A third question, from CBS News, is about the next chairman of the Federal Reserve. Many see two top choices: Larry Summers and Janet Yellen. For more, watch this from CNNMoney. 3:26 p.m. ET: "I think people have questions about this program," Obama says, adding it's important for the government to provide answers about how citizens are being monitored. "There's no doubt that Mr. Snowden's leaks triggered a much more rapid and passionate response than would have been the case if I had simply appointed this review board." Now hold on. Did Obama just say he signed an order that would give whistleblower protection to Snowden? That accurate? 3:24 p.m. ET: Information about the classified NSA programs has come out in "drips and drabs," Obama says, and has included a lot of misinformation about how the programs are administered. "Our laws specifically prohibit us from surveilling U.S. persons," he says. Obama: "No, I don't think Mr. Snowden is a patriot." Says he wanted review of surveillance before leaks. 3:23 p.m. ET: Asked about the man who leaked classified NSA documents, Obama says, "No, I don't think Snowden is a patriot." He adds he would have rather the NSA programs be discussed without their details being leaked illegally. POTUS Qstn 2: Can u get things done w/ Russia w/out good relatinship with Putin? And do you now see Snowden as a whistleblower? Patriot? 3:21 p.m. ET: Obama, asked by NBC about his personal relationship with Vladimir Putin, says "I don't have a negative personal relationship" with the Russian president. He adds that analysis of the two leaders' body language often focuses on Putin's posture. "He's got a kind of slouch like a bad kid in the back." POTUS: "If Russia does not have gay or lesbian athletes, it will probably make their team weaker." In presser @BarackObama says he does not think US should boycott Sochi olympics over Russia's anti gay rules. #BoycottRussia. Human rights can not be negotiated. 3:17 p.m. ET: Obama says the U.S. must "take a pause" in dealing with Russia to assess where the relationship stands. He notes that while he won't attend a bilateral meeting with Putin in Moscow, he will attend the Group of 20 summit in St. Petersburg in September. And he adds a boycott of the 2014 Winter Olympics in Sochi, Russia, is not on the table, despite a new Russian law banning "homosexual propaganda." POTUS Question 1: Russia. How much of the problem is Putin? And are there any additional punitive measures you can take after Snowden? 3:16 p.m. ET: First question, from the Associated Press, is about the U.S.-Russia relationship in the wake of Edward Snowden being granted asylum in the country. "There's always been some tension" since the Cold War ended, Obama said, noting there was both cooperation and competition between the two nations. I wonder if you'll need a password to log into the CIA's website on transparency. UPDATE: Here's the administration's white paper, laying out their legal rationale for the government surveillance programs. 3:14 p.m. ET: Lastly, Obama says he'll create a group of outside experts to review the technology used in the government surveillance programs. Obama said "we can and must" be more transparent in the government surveillance programs. 3:12 p.m. ET: Third on Obama's list: greater efforts toward telling Americans what the government is doing in relation to domestic surveillance. One step is creating a web site that will be a "hub" for greater transparency. 3:10 p.m. ET: The second area Obama wants greater transparency: the Federal Intelligence Surveillance Court (or FISC). He said the court should hear from people raising civil liberties concerns. Obama opens the press conference announcing he will take steps to reform the Foreign Intelligence Surveillance Court. Watch LIVE on CNN. 3:09 p.m. ET: Obama spelling out four areas where he'd allow for additional transparency in the NSA surveillance programs. The first - Section 215 of the Patriot Act, which allows for collection of metadata in phone calls. 3:08 p.m. ET: Obama says it's "important to ask questions" about privacy amid revelations of government surveillance programs. "It's not enough for me, as president, to have confidence in these programs. The American people have to have confidence as well," he said. 3:06 p.m. ET: Obama, beginning his news conference, says he's focused both on delivering his economic message while fulfilling his "number one duty as president" - keeping Americans safe. 3:04 p.m. ET: The White House delivered a two-minute warning to the beginning of Obama's news conference. The President is about to begin his press conference. Watch live on #CNN. 3:02 p.m. ET: Reporting from Moscow, CNN's Phil Black says the relationship between President Obama and Russian President Vladimir Putin is at "an all-time low." Expect Obama to answer questions about the U.S.-Russia relationship Friday. 3:01 p.m. ET: Obama is expected any second. Here's a shot of the East Room Friday. 2:58 p.m. ET: Reporting from the East Room, Chief White House Correspondent Jessica Yellin says reporters are expecting six questions or so over the course of an hour-long press conference. Obama is known for giving lengthy answers during questioning sessions. 2:54 p.m. ET: What might the president be asked Friday? What would you ask Obama? Let us know in the comments below. 2:51 p.m. 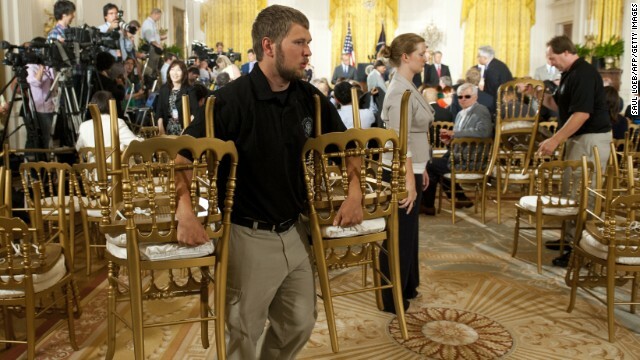 ET: When Obama takes questions in the East Room Friday, it will be his third formal press conference of his second term, and the fifteenth time he's taken questions from reporters. In all, he's completed 124 press availabilities as president, with 25 full-length press conferences. The President has held press conferences twice this term (3/1, 4/30), both times in briefing room. This is his 1st East Room presser. The large majority of Americans don't want amnesty. So basically, Obama is back peddaling on al Qaeda? Guess they aren't decimated afterall. Thank God for President Obama!!!! the disgrace obama is no president!!! LOL . . . he knew he was going to do this prime time speech . . . he was actually waiting on the bonehead & gang to actually leave . . . So here's the deal : he doesn't have a "republican Counter punch" . . . Why ? because they are all on Vacation, and at their home state. Obama doesn't have to need a "counter punch" from the republicans, as long as they are not in the capitol bldg. Not having health insurance is not the same as not having health care. It is if you cannot pay for it. 19 American embassies are closed under "specific" and "serious" threat of attack from al Qaeda, the enemy that struck America on 9/11. At the same time, the Administration is sending weapons to the Syrian rebel army, an army dominated by al Qaeda. Why are we arming the enemy? Even the liberal New York Times admits that the Syrian rebels are dominated by extremists, with al Qaeda forces running power plants, food production, and setting up Islamic courts. Syrian rebels have even beheaded a Catholic priest. They've been caught on film committing unspeakable war crimes. Obama says, "No, I don't think Snowden is a patriot." Snowden, like Manning, believes that everyone in the world should have open access to all of America's secrets, including detailed operation data on ongoing operations. He does not believe that everyone, or anyone, should have such access to information from China or Russia or any other country. There is just no way to spin that as patriotism. Why don't some of you people that have all the answers run for president in 2016. You will have to actually work instead of blogging all day from your 9-5 job or your trailer park when you should be working. Why believe anything he says? He has been caught in lie after lie on the survailance scandal, the Head of the NSA has admitted to lying under Oath. We know that their word and Oaths mean nothing to them. Why believe? This is a PR stunt only. "Ok, ok! You found out, fine, I'll talk about it some, but only because you won't shut up about it". " There was no secret about this. Everyone knew what the Patriot Act and FISA made permissible. Acting surprised that making it permissible resulted in it being done is evidence of brain damage. As much as I would love to think that Obama is a beacon of change, I am convinced that there isn't a single politician who, once rising to this level, has a shred of the integrity and idealism that likely led them to public office in the first place. They are all liars and thieves. Is that the new code-phrase for "spend tonnes of money and soak the rich?" Obama bows down to Snowden! Sweet! Neither is PFC Manning to say the least. Obama is no patriot. I can't believe I voted for him. Can I take my vote back please, I don't know what I was thinking. Another vacation . . . wish I had just ONE this year! Vacation from what . . . IRS - still a mess; Snowden - unattainable; economy - mess - Yep - go on vacation, you don't ya? The Framers of the Bill of Rights did not purport to "create" rights. Rather, they designed the Bill of Rights to prohibit our Government from infringing rights and liberties presumed to be preexisting. ~Justice William J. Brennan, 1982.
" until they put up a viable alternative that gets those 30 million folks health care and saves money beyond what the ACA does, then they have zero room to complain about that assessment." Who was that woman in the maroon dress that didn't stand when the President came in? She was sitting on the far left of the front row.